Friday Wrap-Up for September 14, 2018 – News from Grimross, Graystone, TrailWay, Niche, Valonray, and much more! Jiminy Cricket we’re late today! We blame the one who took this week off, the one who barely survived the Tata takeover at Battery Park last night (although the jury’s still out on his dignity), and the one who inexplicably went to bed at 8:30 PM last night and slept clear through until morning. We’ll let y’all try to figure out which one is which. For now, enjoy another 3,000 or so words about beer and beer event news in Atlantic Canada for the last full weekend of summer (*sob*)!! Fredericton’s Grimross Brewing is re-releasing their Belgian Blonde known as Grimdonk today. Described as, “elegantly crisp and golden, with balanced fruit and spice notes,” you’ll find this dry finishing beer available both on tap and in cans (for the first time, we think) at the brewery. And if you’re out and about in the area this afternoon, they’ll be tapping a special cask of this beer that’s been fortified with blackberries at 2 PM. There’s only 20 L of that version, though, so best hook off work a little early if you want to make sure to get a taste. Staying in Fredericton with the “other” G brewery, Graystone put a new ESB on the taps late last week. Amber in colour, with a medium mouthfeel and a typically English lower carbonation level, Grizzly ESB is a 5.1% and 42 IBU easy drinker. The aroma is sweet and malty with a subtle hop earthiness, and the flavour favours mild caramel and biscuit notes and a slightly spicy finish from the traditional English hops used. It’s still listed as on tap on the brewery website so you should still be able to find it on tap for pints, crowlers and growler fills at the brewery. And in other Graystone news, one of their flagship beer, Patagonia Pale Ale is now available in 473 mL cans at select ANBL locations. See this Instagram post for the full list of locations where you can grab yourself some for the weekend! Not to be left out, Fredericton’s lords of lupulin, Trailway Brewing have yet another new and interesting beer on the docket today. Featuring a theoretical IBU rating of 0 due to all the hops being added in the fermenter after the beer was chilled, Days Done is a crushable American Pale Ale coming in at 5% ABV. Leveraging hops from both New Zealand and the United States, it has a slight bubblegum character at the front of the palate and a rounded citrus finish. Check it out this afternoon and/or tomorrow afternoon at the brewery where they’ll also have the Gastrognomes food truck going from 3 – 8 PM. It’ll be an ideal beer for pre-gaming the Harvest Jazz & Blues Fest downtown! Hanwell’s premier brewery, Niche Brewing, has a brand new beer out this week, the latest in their Persuasion Series (if it’s not a thing yet, maybe it is now?). Grasping hold of the last days of Summer, they have released Boysenberry Persuasion, a 4.2% ABV fruited sour. Using the same base as their Pineapple Persuasion, they added boysenberry puree during secondary fermentation, resulting in big raspberry- and blackberry-like flavour and aroma, all on a tart base. It is available around Fredericton and Moncton, including on tap at Grimross, which means you’ll be able to grab growlers of it (and their Riptide Rye Session IPA). Rejoice the weekend! 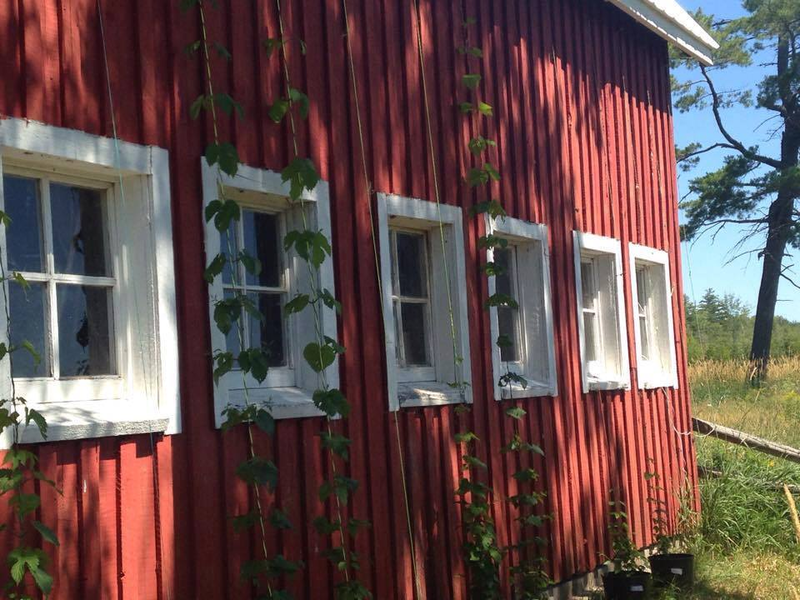 Down the road from the capital, outside Moncton in MacDougall Settlement, NB, Valonray Farmhouse Brewery has now achieved their previously stated (and lofty!) goal of producing only mixed fermentation beers! With only about 50 bottles of clean-fermented beer left on hand as of earlier this week, they’ve fully committed to mixing bacteria and yeast to produce tasty beers in the Continental style. They’re also planning six or so releases in the next few months, with some special treats already settled down for some (much) longer term aging. In the near term, though, they’ve got two releases to tell you about this week. The first is Terroir, a farmhouse ale with 70% Horton Ridge pale malt to which wheat, oats, and some sugar were added to round out the grist. The yeast used was from Escarpment Labs (although Valonray’s next fermentation goal is to use only their own yeast) along with Brettanomyces. Described as “unlike any Brett beers we’ve tasted,” it’s earthy, with a honey-like finish and little to no fruit or funk detectable. Their second new release is Farmhouse 2 which started as an experiment but turned out just fine. With 70% pale malt matched with 30% Vienna in the grist, some residual sweetness and malt body is to be expected. Fermentation-wise, this one’s a bit crazy, with 6 Brett strains, including 2 sources of Brett B, one Brett C, one Brett Q, and two wild Bretts from Terroir all in the mix along with Lactobacillus. The result is a beer where the Lacto is not prominent, so it’s not as tart as the first iteration, but there are prominent grapefruit and berry notes. Look for both of these beers to be available at select ANBL locations in the Moncton area soon. Moving across the Bay of Fundy to Nova Scotia, Annapolis Brewing Co. has a brand new small batch specialty beer available this week. Called Calientide, the key ingredient was 4 pounds of honey provided to the brewery by the Halifax Honey Company. But this wasn’t just any honey, this is what they call “Stingin’ Hot Honey” which is their chili-infused product. Added to the kettle at flameout, it made for a rather spicy wort initially, but ended up producing a subtly spicy and slightly hot beer. The heat and spicy character were also boosted by the addition of the chilis that had been used to infuse the honey to the secondary fermentation vessel along with some roasted jalapeños. The result is a 4.7% ABV beer with 21 IBUs that features light peppers on the nose and a subtle spiciness on the finish. Look for this one at the brewery and very possibly tomorrow morning at their market stall. From the Valley into the City, we’ll start on North Street with Unfiltered Brewing who have brought back a beer not seen for many months, Play With Fire. At 7.5% ABV, this Smoked Imperial Schwarzbier is jet black, and features smoke flavour and aroma, perfect for the waning warm days and cool nights of late summer. Drop by the brewery and Charm School taproom to grab a pint and growler today. Around the corner on Robie Street we turn to Good Robot who have their usual two releases this week. Tuesday’s release for Beta Brewsday is the result of a visit from Marci of Horton Ridge Malt & Grain, who, in a shocking turn of events, brought her own malt to the party! Using organic rye and 2-row as the base with a little bit of roasted barley, the intention was to turn out a Rye IPA, but brewer Kelly Costello couldn’t bring herself to mask the lovely rich malt flavours with the planned dry hop. So Pretty Fly for a Rye Guy will be listed as a Rye Pale Ale with an ABV of 4.0% and a low/medium bitterness that still features hop flavors from late additions of Vic Secret, Enigma, and Saphir hops. On the GR Alpha system this week we have the return of their Gose-inspired Goseface Killah, a sour german wheat ale featuring Sorachi Ace hops. At 4.8% ABV and 11 IBU, this tart and refreshing beer with coriander aroma and lemony acidity might be just the thing to help it keep feeling like summer as the temperatures start to drop. And two streets over, Propeller has a new Gottingen Small Batch on the go today, to go along with their usual Friday cask. Which isn’t their usual cask. We can explain. The small batch is called Tropical IPA and it features both some very tropical hops in the form of orange-y and grapefruit-y Citra and passionfruit-y and pineapple-y Galaxy, along with additions of real fruit, including peach, apricot and mango. The result is a 6.2% ABV beer with a complex tropical fruit character that still manages to sport a crisp finish. This one is on tap at the brewery for fills and pints and is also already on tap at all ANBL Growler Stations. As for today’s cask, in lieu of a beer they’ll be sporting a Shandy instead! From late afternoon onwards, come down to the brewery and try a take on a classic concoction comprised of beer (Propeller’s classic ESB in this case) blended roughly one-to-one with lemonade (hand-pressed by Assistant Brewer Denys Ploughman). No growler fills of this one, so you’ll have to sit and have a pint. Rough life, wha? Around back from the Propeller tap room in their small batch brewery / warehouse, Stillwell Brewing is releasing the second batch of Solo tomorrow. With a base recipe of PIlsner, Wheat, and Oats, it was hopped in the kettle and barrel with German hops, and fermented with Stilly’s house blend of yeasts and bacteria. This batch of Solo was brewed at the same time as the first (which was released in February), and has been bottle conditioning for an extra few months. LIke batch 1 (and you could probably guess from the name), Solo b2 is a single-barrel beer, as opposed to a blend of several barrels. The barrel character comes through a bit more in the final beer, as well as a little additional bitterness, as compared to batch 1, but still expresses the delicate and funky yeast character. Drop by the brewery 12 – 4 PM tomorrow to grab your bottles, around the back of 2015 Gottingen Street. And our last hop (hah!) in Halifax this week is to Tidehouse Brewing downtown on Salter Street where they’ve got a brand new bottled offering. BIG Bruiser IIPA is a double/imperial IPA weighing in at a brawny 10% ABV. Medium to light in body and with a deep orange color, it was hopped entirely with Cryo hops, specifically the Simcoe and Ekuanot varieties. To finish, the Japanese citrus known as Yuzu was added for an extra kick. Dank, boozy, and hoppy, it’s available at the Tidehouse Tiny Tasting Room in 340 mL bottles (maximum 6 to a customer) and 4 oz samples only, no growler fills. Probably for the best, this one’s going to hit like a brick. Heading down the 102 from Halifax and then swinging onto the 104 at Truro will eventually get you to Stellarton, where Backstage Brewing has put together a couple of variations on a theme. Last week we told you about The Edge, an IPA featuring Simcoe, Amarillo, and Mosaic hops. This week they’ve upped the ante with fruit! The Edge Volume 2 is that same beer after having sat on pineapple for a while and ditto for The Edge Volume 3 except swap in mango. These extra-tropical bad boys are available only by the glass at the Backstage taproom and we suspect that where they were released on Wednesday they may not last much longer; so if you’re lucky enough to be close by, maybe swing by Bridge Ave for a taste! And lastly for Nova Scotia, following the 104 to Cape Breton and opting for North on the 105 will eventually get you to Nyanza, where Big Spruce Brewing will be waiting with open arms and a brand new beer. Can You C’est Brut IPA is BS’s entry into the 1.000 Final Gravity fray, the defining characteristic of the Brut- or Champagne-style IPA that’s come out of nowhere in the last few months. Featuring “bonkers aromatics” from the use of large amounts of El Dorado hop hash (don’t worry, this hash is legal even before October 17th), it comes in at 7.0% ABV and an almost mild (for an IPA, anyway) 24 IBU. Bone-dry, crisp and effervescent, we remind you that it’s beer, so maybe forego the sipping from a flute and head straight to the swilling from a real glass. Pinky extension is negotiable. If that’s not your thing, with the hop harvest just finishing, you can no doubt expect another new beer from Big Spruce in the coming weeks featuring their homegrown fresh hops, and keep your eyes open as we’ve heard hints that a new batch of all-hyper-local One Hundred is on the way. Or just check back here for news, because, as always, we’ve got you covered. Let’s hop the ferry to Newfoundland to round out the new beer news of the week! Twillingate’s Split Rock Brewing has a new beer on tap this week, the bigger and hoppier brother to their popular Gateway IPA. Oathkeeper IPA features the same base malt recipe, but fermented on their English yeast strain, leading to a beer with more body and a touch of residual sweetness at the same 6.4% ABV. As is the case with many of our favourite IPAs, though, this one is all about the hops! Cascade, Amarillo, and Citra come together to give you a ton of great hop flavour and aroma, with citrus, specifically grapefruit, shining through.Oathkeeper is on tap at Stage Head Pub in Twilingate now, but we’ve been told it may hit one of the great Nfld-beer-friendly spots in St. John’s as well. Keep an eye on their social media to see. Port Rexton Brewing has a brand new beer available, and the only place to find it is at their brewery taproom. 9:30 Knockout is a new style for them, a Hopfenweisse. Think of it as a hopped-up of German Weissbier, featuring the iconic wheat and yeast aromas of banana and clove, along with great stone fruit and tropical hop notes, courtesy of Enigma, Mosaic, Chinook, and Simcoe. In case you were wondering, the 9:30 Knockout name comes from the fact that the mash rest of this beer, while typically 60-90 minutes in length, was 5 hours long, pushing their usual knockout time (when the boil is stopped and the wort is cooled and transferred to the fermenter) to 9:30 PM, rather than their usual 4:00. Talk about a full brew day! Get yourselves out to the brewery to toast the hardworking women and men of PRBC. And as summer closes out, please note that their Retail Shop on Torbay Road in town has shifted their hours to Fridays 4 – 8 PM and 12 – 6 PM on Saturdays. Drop by this afternoon for fills of their Horse Chops West Coast IPA, Chasing Sun New England IPA, and T-Rex Porter. 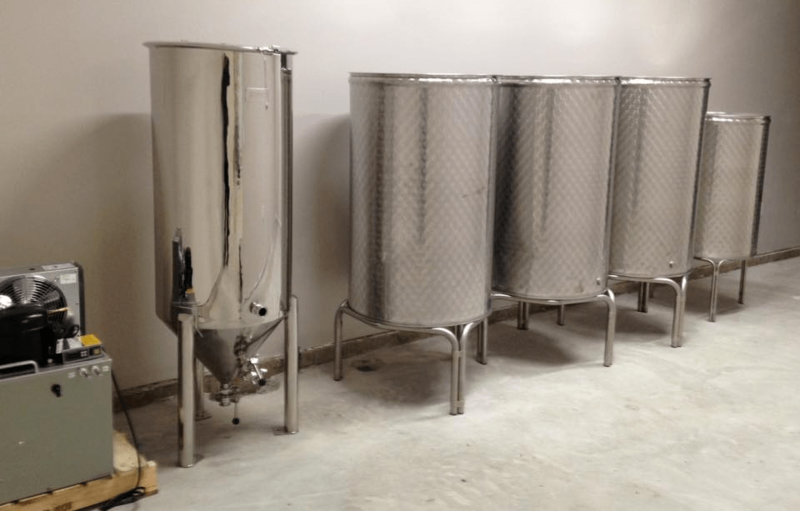 In Montague, PEI, Bogside Brewing will be opening this winter, and are looking to hire a Head Brewer and a Production Brewer for their 1200 litre (10 BBL) system. That team will be responsible for all aspects of the production, testing, inventory, and quality control of the beer and cider they will be making. Check out the full Job Posting here and get in touch with them now! And in Mahone Bay, Saltbox Brewing is also looking to fill their Head Brewer position. Brewing on a 1200 litre system as well, the Head Brewer will be responsible for all of the ingredient inventory, beer making, and QC at all points in the process. Check out the Job Posting for more details. Drop them a letter/resume to continue your brewing career on Nova Scotia’s South Shore. We’ve got plenty of events to keep you busy over the next few weeks! Speaking of Saltbox, drop in tomorrow to help them celebrate their Second Anniversary! Who knew partying in a former service station could be so fun! Open from 10 until 10, they will be doing door prizes every hour for Saltbox gear and gift cards, and they’ll have Curry Express Food Truck onsite to keep you happy. No party is complete without some live music, and they’ve got that in spades, with The Paul Buchanan Band onsite from 3 – 5 PM, followed by Collage from 7 – 9 PM. And!! Guys!!! They are hosting Beer and a Backrub, where folks from South Shore Chair Massage will help you unwind after a long week, and you don’t even have to put down your beer. Congratulations to the Saltbox family! Marécage Belgian Style Saison (7.0% ABV) – We’ve started brewing it again after a bit of a hiatus. Hopped with Citra and Hallertau Blanc, it has citrus/peppery notes to start and finishes dry. At 7%, it’s surprisingly light! Vent d’âme Belgian Style Pale Ale (5.9% ABV) – A light and refreshing ale you would find in a Belgian bar. “Vent d’âme” literally translates to “soul wind” but is an homage to the muscles from Brussels, Jean-Claude Van Damme. Dirty Black Summer (5.8% ABV)- a well balanced Black IPA with a mix of tropical and piney hops. Tons of Chinook, Vic Secret and Ella, to the tune of 80 IBUs. Spacetime Odyssey Porter (6.5% ABV) – Our coffee infused porter brewed since the beginning. Chocolatey, roasty, coffee-y. Koalatee Pale Ale (5.0% ABV) -Our pale ale hopped entirely with Australian varieties – Vic Secret, Ella, Topaz. Lots of hop aroma (pineapple, citrus), light bodied and completely crushable. Summer’s not over! AND, during the Saturday afternoon party 4 – 8 PM, when the Grand Monk crew will be onsite, they hope to debut a brand new beer; that afternoon/evening, Red Stone Eatery will be onsite with food offerings. In Halifax, Good Robot is hosting the second of their Hair of the Dog events September 22nd and 23rd. Taking over the Garrison Grounds, dogs and their people are invited to hang out to meet other like-minded individuals, drink a bit of beer, and check out the animal-centric vendors. The party goes 11 – 11 each day, and the proceeds for the event go to the NS SPCA Dartmouth Shelter and Halifax Pop Explosion. Check that first link for the list of vendors who will be onsite. Garrison Brewing is hosting a three-week Oktoberfest celebration this year, starting next Saturday, September 22nd, and repeating again the next two Saturdays (the 29th and October 6th). They will have Asado Wood Fired Grill onsite from 11AM each day, and have live music from an Oompah band starting at 2PM. The event is free, and their spot is dog and family friendly, so your pup could take you to two events on the 22nd! And on the 6th, they’re cranking it up for Das Big Party, with Dave Sampson playing a live show in the brewery that evening, so stick around! There are still a few tickets available for the Atlantic Canadian Craft Brew Fest, being held at the Moncton Lions Club on September 29th. Featuring more than 40 breweries, cideries, and mead producers, this event also raises funds for the United Way. Many of the producers will be on hand themselves, making it a great opportunity to chat with them and learn more about their products (and bend their ear to talk about new possible ones!). Grab your ticket for the 7:30 – 10 PM session here, and learn more about other events on their website. Lastly, in Halifax, the Stillwell Beergarden will be getting a big facelift on September 29th, as they host an Oktoberfest event on Spring Garden Road. Open as usual from noon, they’ll be featuring NS-brewed German style beers, as well as some fresh brews from Germany, all to celebrate one of the most influential countries in the beer world. Of course, they will have some great Oktoberfest-inspired food, and a must-have for any Oktoberfest event, a live oompah band from 3:30PM on. There will be a cover charge for the afternoon to pay for the band, which you can pre-pay at either location to be added to the list, $7 in advance or $10 at the door. So grab your dirndl or lederhosen, and we’ll see you there. Prosit! My name is Philippe (Phil) Fontaine and I’m the owner and brewer at Valonray Farmhouse Brewery. After graduating from university with a degree in electrical engineering, I joined the Canadian Armed Forces as an Engineering Officer and served in this role for almost 10 years. Since last summer, my wife Allison and I have moved back to south-eastern NB, cleared an overgrown area, and built our farmhouse brewery from scratch next to a planned cherry orchard and hop yard that is still in the works. While posted at CFB Gagetown in 2012, I became interested in craft beer by being exposed to Fredericton’s vibrant craft beer community and watching the number of breweries explode. Shortly after, I started homebrewing and the hobby quickly became a passion. Soon after, I was brewing an all grain batch once a week (or more) and reading as many books on the subject as I could find. I went from mostly brewing IPAs to eventually becoming more interested in the myriad Belgian-styles, and started to focus my reading more towards them. Some of the books that had an impact on my brewing style were Farmhouse Ales by Phil Markowski, Wild Brews by Jeff Sparrow and more recently, American Sour Beers by Michael Tonsmeire. I probably read these books 15 times, trying to hone the brewing techniques and recipe development of these types of ales. By reading these books, I discovered a facet of the American craft-brewing movement that was lacking in the Canadian one, that of making traditional Belgian-style sour ales and wild fermentations in general, such as the examples of Jolly Pumpkin, The Bruery or New Belgium. When I started the business plan these types of breweries were non-existent in Atlantic Canada and they are still are quite underrepresented to this day. Being originally from just outside of Moncton, I wanted to settle back on the family farm and I knew there was an opportunity to open a brewery in the area, being the largest population centre in New Brunswick and only having one micro-brewery and a handful of very small nano-breweries. Our key philosophy is sourcing the raw materials as locally as possible. We are making Belgian Style ales, but all of our ingredients are sourced locally, when it’s possible. 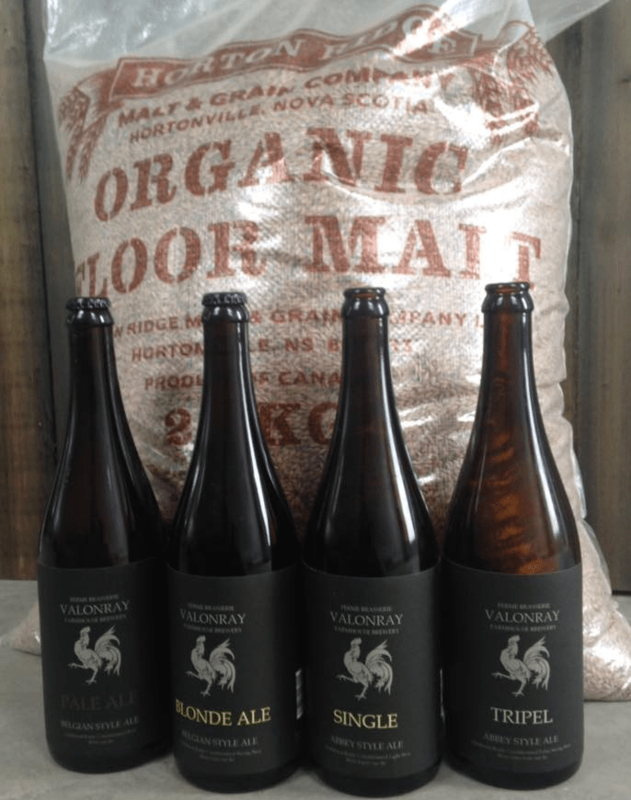 All of our malted grain comes from Horton Ridge Malt and Grain from grains grown in the Maritimes. The unmalted grain found in some of our ales comes from a farm 10 km down the road. We currently have 50 beehives on the property, and plan on growing all of our own hops within the next 5 years, as well as having a fruit orchard used for making barrel-aged fruit sour ales. Within the next year, we will release a beer that will be 100% Canadian, including the “Belgian-style” yeast. We believe beer is an agricultural product and this state of mind has a profound impact on how we operate. Can you tell us about the beers you plan on offering initially? We aimed for simpler recipes as an initial release. We did not want to overcomplicate things on a new system, and the beers we really want to make take longer and more tanks on hand to make. Our initial line-up of beers are all open-fermented and bottle-refermented, but they only contain various Saccharomyces strains. We have a Tripel, a Single, a Blonde ale, Pale ale and a Saison. The Tripel and Single have a similar recipe, but the results are quite different because of higher amount of simple sugars in the Tripel. The Blonde is actually closer to a Belgian Golden Strong, but with lower alcohol. The Pale ale was designed to be slightly more malt-forward to highlight our use of craft malts. The Saison is definitely our flagship, and various iterations of this recipe will be released in the future. Our five initial beers will be modified within the next year, as we plan to switch to an all-Brettanomyces production. Our first Brett-inoculated batch was brewed this week, with probable release in September. The planned Brett lineup will look similar to the current clean beers, but we also want to offer a Saison brewed with wild Ontario yeast and Brett, a Witbier, as well as a Norwegian Kveik style ale. We are slowly starting production of our sour beer and will eventually offer an Oud Bruin style ale, a Flanders Red style and a Lambic style (including Kriek and Framboise). The Oud Bruin is scheduled for production in 2 weeks and should be ready in a little over a year. For a seasonal, we have a Bourbon Barrel-aged Tripel planned for the fall. Our beer will be sold solely in 750 mL bottles in our on-site sales room and in select ANBL locations and restaurants. We plan on rolling out some sort of growler program by the summer. It’s a bit of a technical challenge, as we only do bottle-refermentation. What we have planned would be in essence a bottle exchange program, to be re-used for refermentation. Do you have some initial accounts in the area lined up to sell your beers? We do not have any initial accounts firmly in place at the moment. Our focus has been to get our sales room approved and to get our beers listed for sale in ANBL locations. Have you had any assistance from other brewers in Atlantic Canada? We gathered input from other homebrewers and talked to multiple brewery owners, but had to develop most of our systems and procedures ourselves, as we were definitely going off the beaten path with our fermentation techniques. No breweries in eastern Canada use our methods, so I gathered as much info I could from interviews and articles from the American breweries. We are hoping to have a sour program established within this time frame and a cherry orchard and hop yard established on the brewery grounds. We should have the direct sales room open, and our bottles on ANBL shelves, within 2 weeks. All the approvals are in place and we are just waiting on the paperwork to be finalized. What size/manufacturer/type of system are you be brewing on? Expected output (monthly, yearly, etc)? 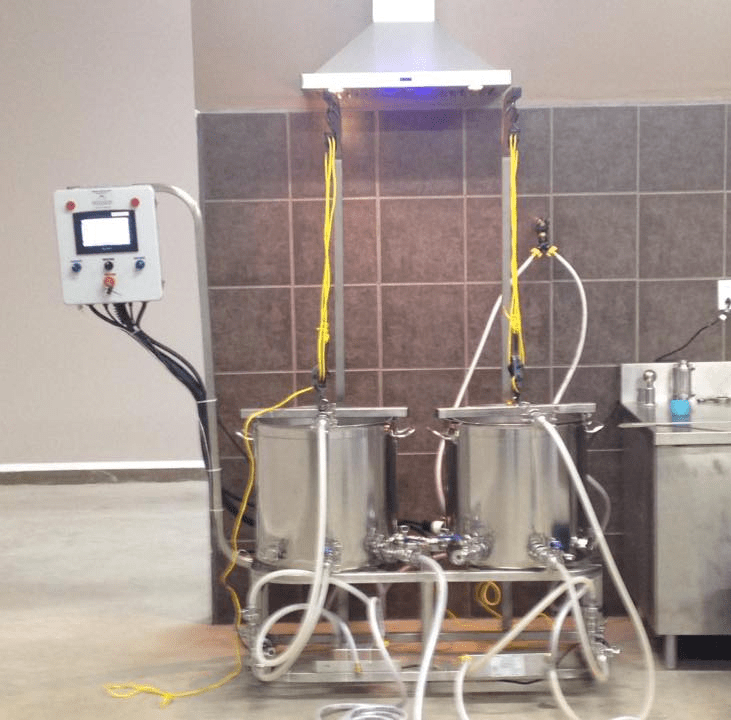 We brew on a 1 BBL (~120 L) Colorado Brewing Systems dual pot system. We do double batches (2 BBL) on our brew days. Our current monthly output is 800 L, and the projected monthly output is 3000 L once we start working at the brewery full time. Our techniques are quite unique in these parts, as we do open vat fermentation in a warm room at high temperature; we will eventually inoculate all our ales with Brett (some with bacteria). All our beers will be aged in barrels or in stainless wine tanks for a minimum of 4 months, and all our beers are bottle refermented in 750 mL bottles. I enjoy beers that use phenolic/estery yeasts, as well as sour beers, New England IPAs, and occasional British style ales. How about a favourite style or ingredient to brew with? I enjoy experimenting with adjuncts (raw oats, buckwheat, rye, different sugars, etc.). Congratulations to Phillipe on all of his hard work coming to fruition! We look forward to sampling Valonray’s first beers, soon. Follow them along on Facebook and Twitter for updates on when their beers are available, and of course we’ll be sure to mention these details in our weekly Friday Wrap-Up.